Females are slightly broader in the mid-section when compared to slimmer males. During mating, males will burrow a trough into substrate, then try to entice the female to follow them into the trough. Observed male behaviour during attempted mating includes 'tailstanding' and 'shimmying'. Peaceful fish and good in community tanks. Don't put this fish in with other similar shaped fish, like the Ruby Shark or the Flying Fox as these other fish are territorial and will chase them away. Likes algae and catfish pellets and flakes, will also eat blanched vegetables. One of only a few fish that actually eats hair and beard/brush algae. May eat aquatic moss like Java moss. Feed sparingly depending on the algae content of it's environment. If it's algae-infested this fish will only need supplemented food once or twice a week, however, if it's environment is entirely algae-free this fish will need supplemented feeding every day. The fish tends to be seen eating constantly if kept with other tank mates, on fish food for other fishes, as well as constantly nibbling at algae throughout the day. Likes plants and well oxygenated water. Keep in a hooded tank if water oxygen levels are prone to falling, to avoid the mishap of this fish's jumping out of the tank. A generally peaceful fish. It likes to rest on top of leaves which can support it's weight, such as the Amazon Sword, and on driftwood/rocks if present in the aquarium. This fish can be shy. It is territorial towards its own kind and should either be kept singly or in groups of 5 or more. It is a graceful swimmer, and likes to swim in the current. Long slender brown/gold fish. 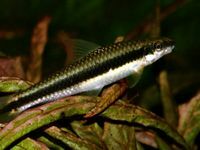 Has a bold, black strip running the full length of its body to the very edge of its caudal fin (other similar species stop short of the caudal fin). Has Rostral‎ barbels ('moustache'). Easy to confuse it with the Flying Fox (Epalzeorhynchos kalopterus) which has a extra thin gold/bronze strip on top of the black strip. Very similar to the False Flying Fox when young, except that fish has a light strip running above the black band. Very similar indeed with the Siamese Flying Fox except with that fish the black band doesn't go into the caudal fin. This page was last edited on 7 April 2018, at 21:43.